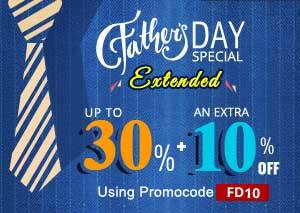 Get ready to avail some good discounts and save up to 30% with an extra 10%, as a Father's day Sale is now ON. Offer ends midnight Sunday 18th June, 2017. Use promo code FD10 and get a straight 10% off. Click here to view our latest collection. Offer Valid till Sunday, 18th June 2017.